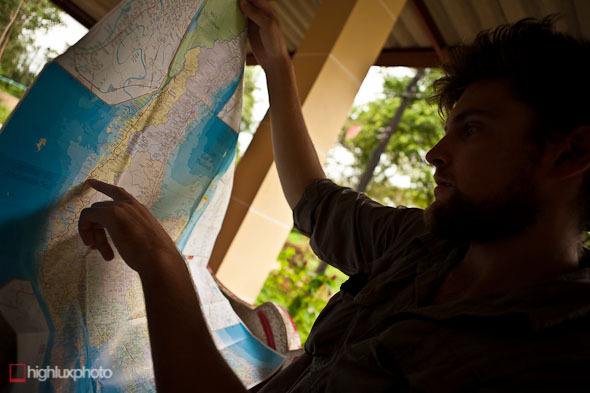 Day 169: Chumpon – Phato (110m), 113km. Flat then rolling via Highway 4006 heading west. 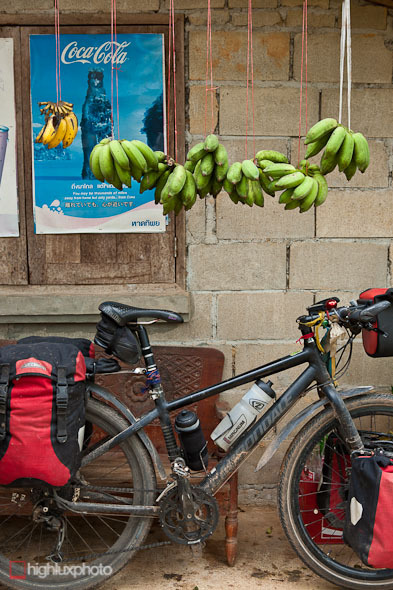 Day 170: Phato – Suk Samran, 92km. Rolling, then flat down Highway 4 (two lane). Day 171: Suk Samran – Unknown town, 104km. Rolling on highway and back roads. 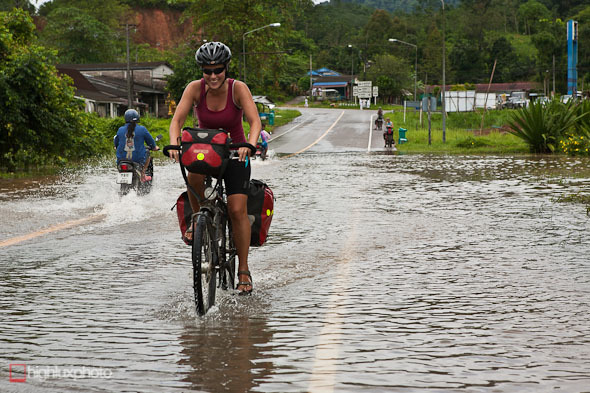 Day 172: Unknown – Krabi, 127km. Rolling on back roads and Highway 4. 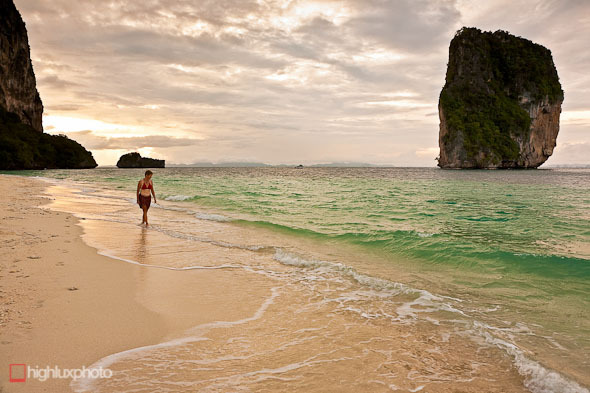 Day 173 – 176: R&R at Railay. Back in Bangkok we’d made arrangements to meet two UK cycle tourists Rebecca and Ryan in Chumpon, on Thailand’s east coast. We’d made loose plans to start off from there together and ride to the west coast and then south. The only other people we’ve ridden with in 6 months of touring have been our Kiwi friends Katie and Charlotte, and we were looking forward to some company – and someone to share the drafting with! We met at the Farang Bar in Chumpon, me and Hana hot, sweaty and spaced out after a hot days’ riding south and Rebecca and Ryan fresh off the island of Ko Tao where they’d been chilling for a few days. 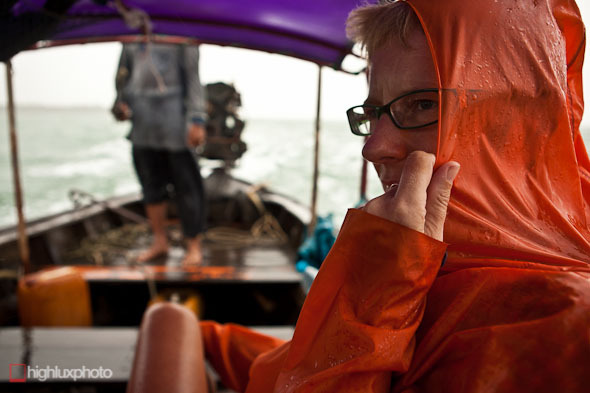 The next morning we set off to cross Thailand’s peninsula, the Isthmus of Kra. 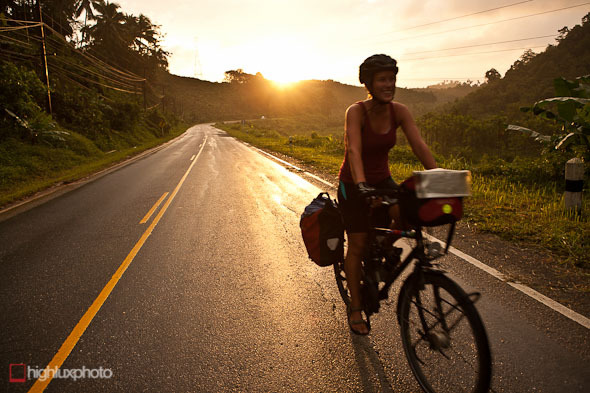 Rebecca and Ryan are in the midst of an epic cycle tour from the UK to NZ. They’ve been through twenty-something countries in the year it’s taken them to get to Thailand and from here head to Singpore, where they fly to Australia, then cross from Perth – Sydney via the Nullabor and then tour NZ in early 2012. 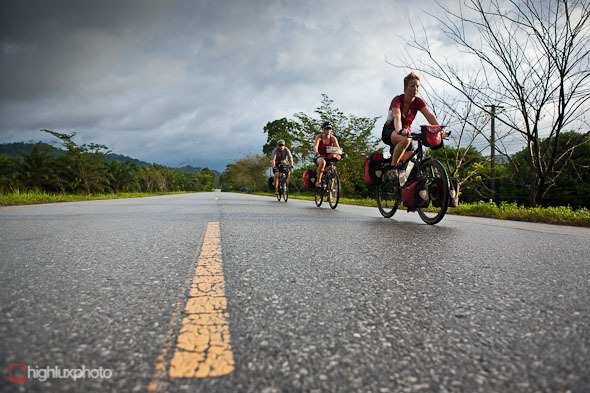 Check out their blog here for some inspiring trip reports and great videos that show what long distance touring is all about. It was blissful to finally depart the busy and noisy Highway 4 and get onto a quieter road. 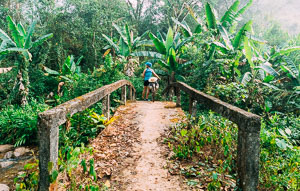 We picked up the 4006 not too long out of Chumpon and were loving the quiet, rolling highway as it wove its way through banana plantations and jungle. Day two out of Chumpon we rejoined Highway 4 on the west coast, but were psyched to see that it had shrunk to only 2 lanes and was a hell of a lot quieter. 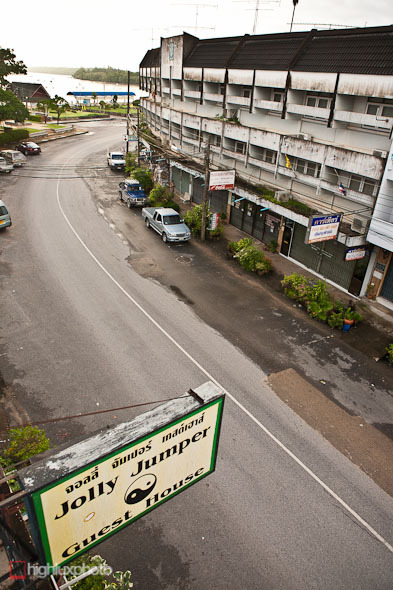 That night, after a consistently wet day, we stayed in Suk Samran. 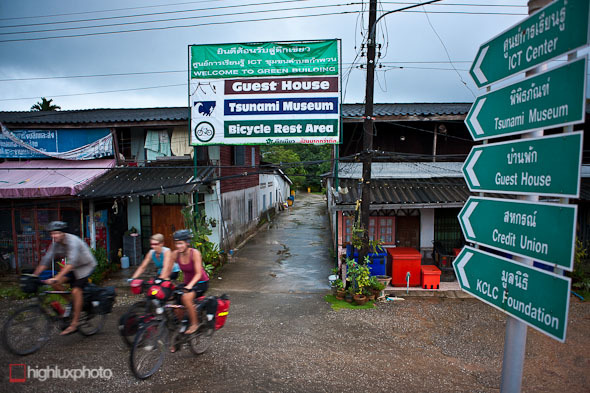 There’s a sweet guesthouse there that’s annexed to the town’s Tsunami Museum. The generous caretaker there gave us a summary of the 2004 tsunami’s effects (deaths were in the hundreds), showed us around the museum, sorted us out with some internet and then drove us to a local restaurant for a feed! 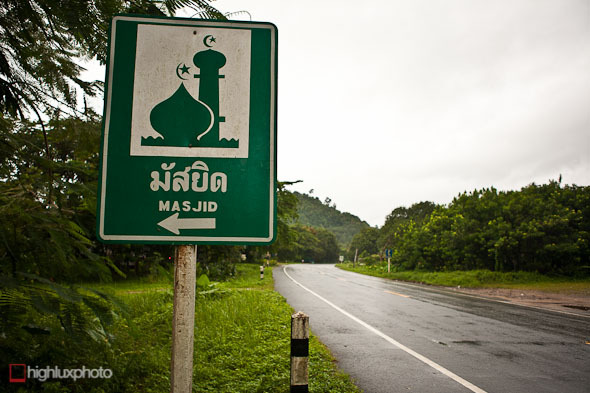 Like much of southern Thailand, Ranong Province is predominantly Muslim and mosques far outnumber wats and Buddhist monuments. All women wear headscarves, alcohol is scarce and there are few dogs about (they’re considered unclean!). 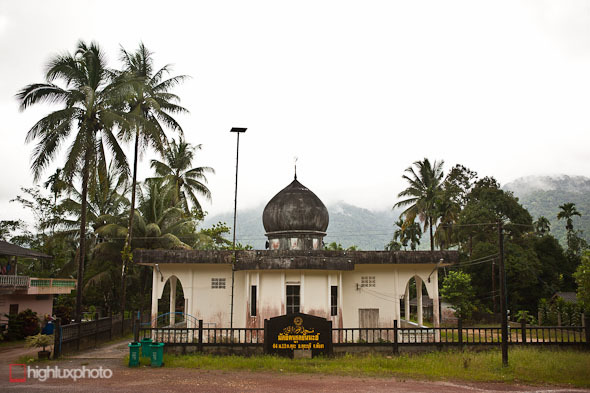 Much has changed since the 2004 Boxing Day tsunami that killed so many people here. While the death toll was much lower than that of Banda Aceh, the whole coast was hammered by the wave’s force and many people lost their lives or livelihoods. 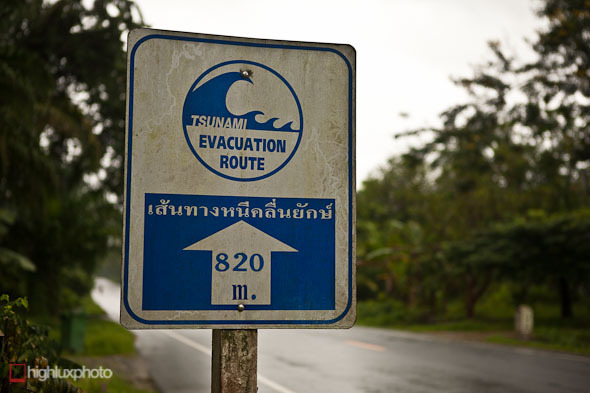 These days there are early warning sensors, evacuation routes and more careful civil planning. This was another common sign! 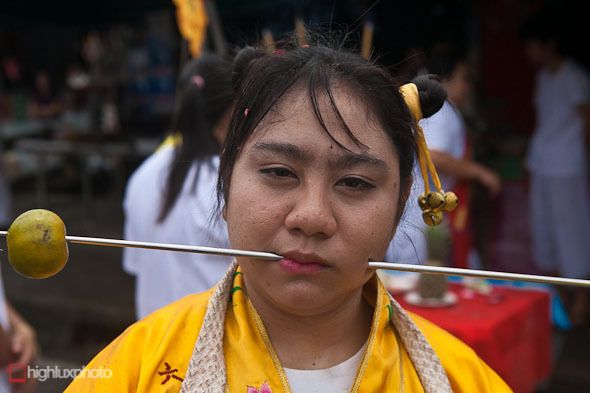 Our ride down the west coast coincided with Thailand’s annual Vegetarian Festival, which has Chinese roots. It seemed to consist of convoys of 4WD utes packed with people who had reached a trance state: their eyes rolling back in their heads, often with steel rods piercing their faces, while others detonated strings of firecrackers and held up those who could no longer stand. 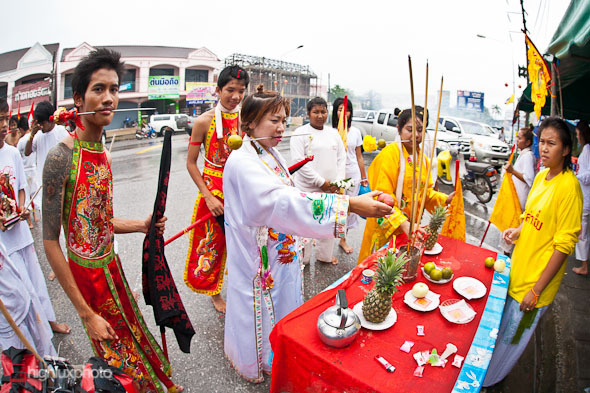 Local villagers set up stalls for the trancers to take tea from and pray at. We were really enjoying having some company after so long on the road on our own. Rebecca and Ryan have tons of stories from their trip and many experiences that have parallelled ours. We found we were totally on the same page when it came to touring so it was a smooth 4-person peloton that rolled down the highways of the coast. 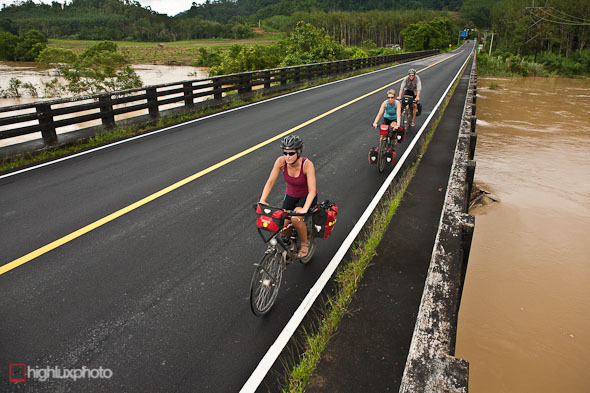 Ranong province is the wettest in Thailand with eight months of rainy days per year! 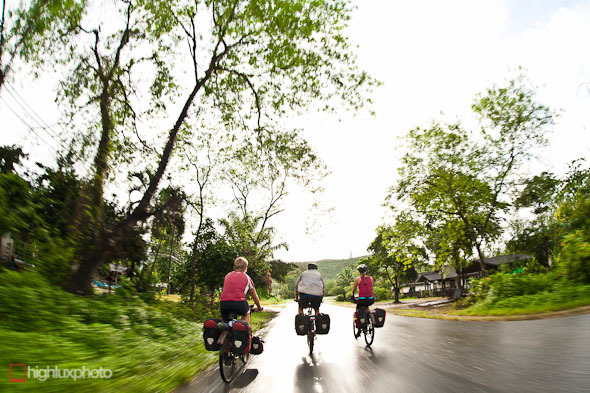 We definitely copped it once we crossed the range from the east coast and every day on the ride to Krabi had us battling through downpours – and the odd bit of flooded road. But at least cars were scarcer. Bananas are our number two staple, after rice. Mostly we followed highway 4, escaping from it here and there via detours onto tempting looking back roads. 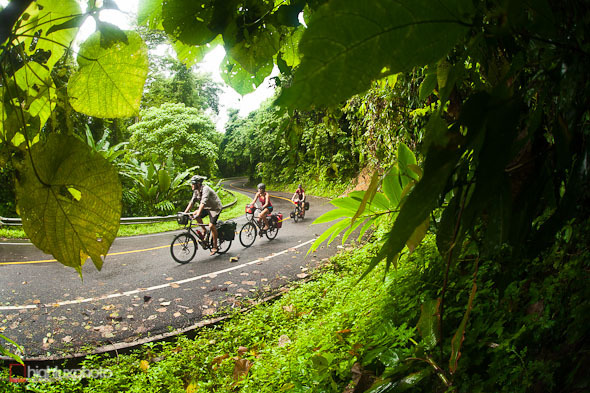 As we neared Krabi province the highway crossed some hills and cut through some quality jungle. No complaints about day two there though! 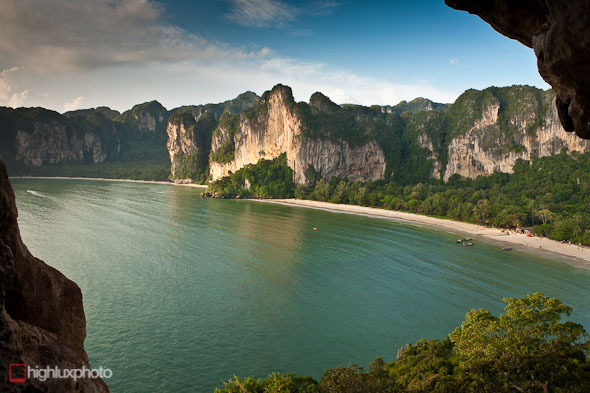 This view of West Railey and Tonsai is taken from a cave in the middle of Tiger Wall that you access via Phra Nang beach and a short cave system. 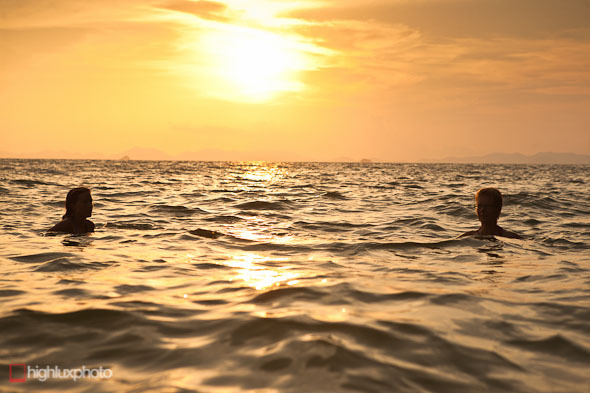 …and a warm, silken sea. 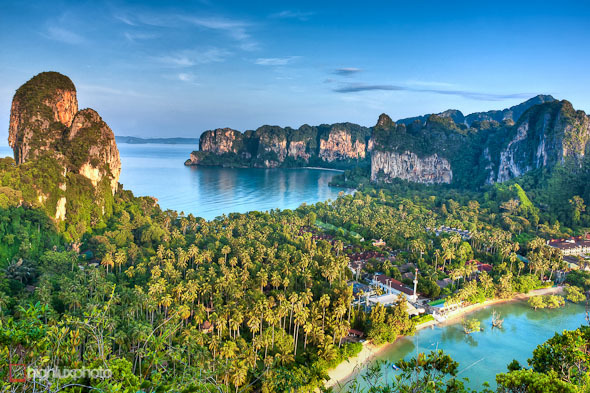 Railay itself has changed a lot in 10 years: the 2004 tsunami forced some fresh construction but the never ending stream of tourists through the place has brought about the rest. 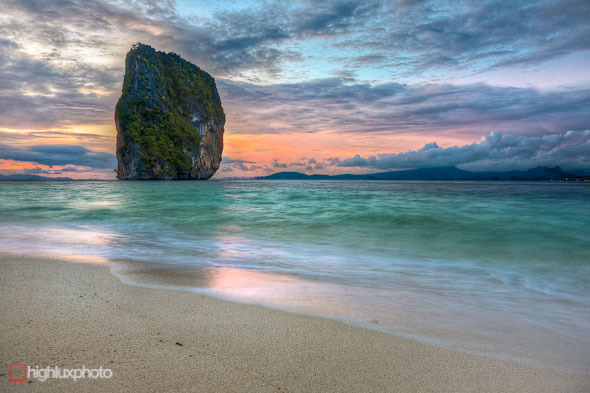 Railay no longer has the strips of flimsy backpacker restaurants it once had, and the resorts have all gone more upmarket, but it still has a unique charm and incredible natural beauty. No tourism development will ever take that away. 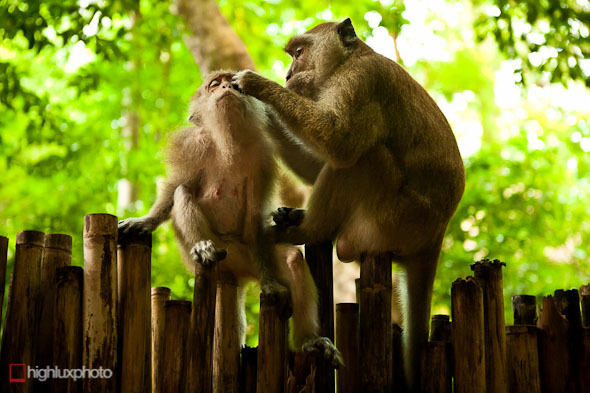 The roaming monkeys add a bit of character to the place too. Happy Island, with yet another going-off sunset on the next night. 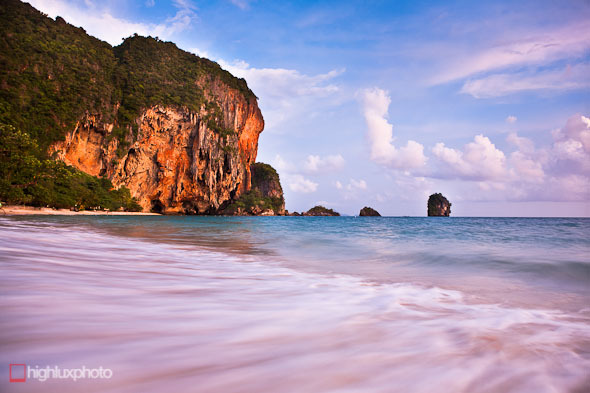 I think Phra Nang beach is one of the best I’ve ever been to. 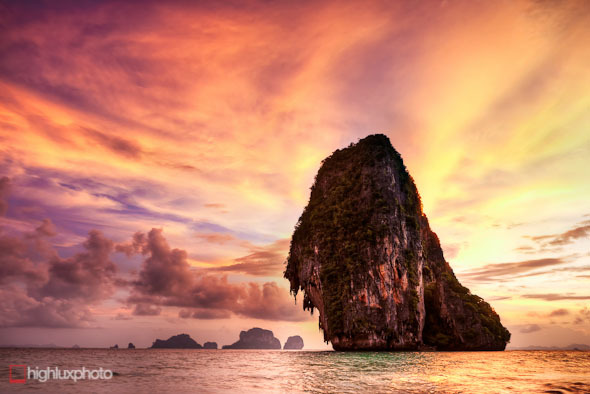 Sure; it’s touristy, but the dripping stalagtites, perfect swimming and distant islands that seem to hover above the ocean give it a magic that’s hard to beat. 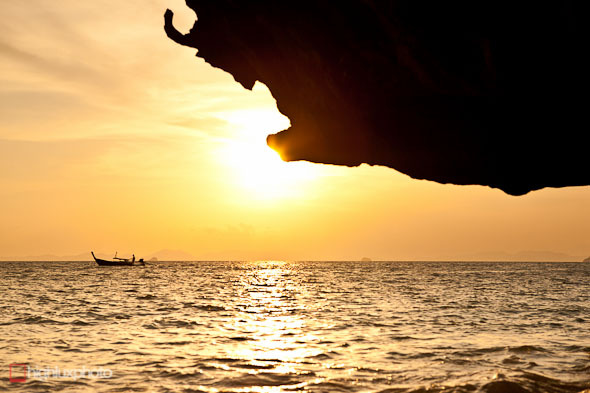 We took a boat out to Poda island for some snorkelling, sunset photography and a tom yum dinner. 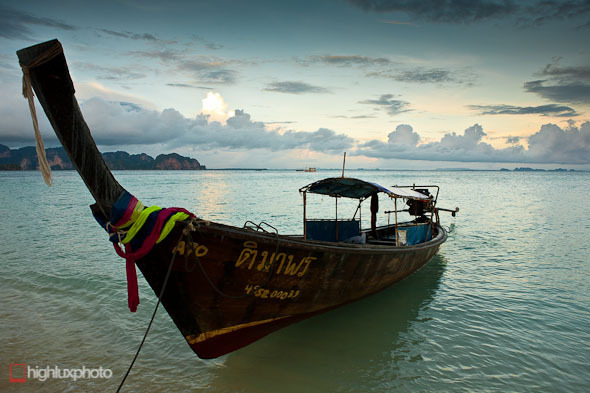 Longtail at Poda Island with the Railay peninsula in the background.